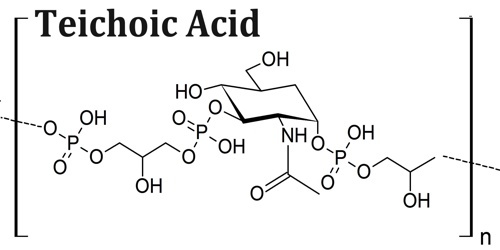 Teichoic acid is any of a class of strongly acidic polymers found in the cell walls, capsules, and membranes of all gram-positive bacteria and containing residues of the phosphates of glycerol and adonitol. It is one of two types of polymers present in gram-positive bacteria, especially in the cell walls. This acid is formed through the joining of either glycerol phosphate or ribitol phosphate groups linked together with phosphodiester bonds. 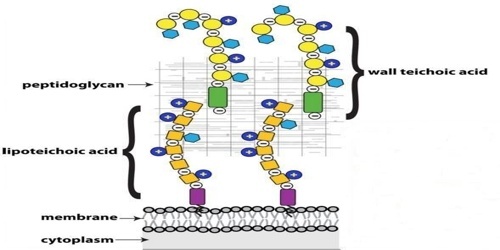 Teichoic acid plays an important role in gram-positive bacterial cell wall integrity, shape and cell division rates. This is carried out by the negative charge of the acid attracting important cations for cell wall stability, such as magnesium and sodium. Additionally, the presence of teichoic acids can contribute to the development of antibiotic resistance in some bacteria. An example of this phenomenon is the development of methicillin resistance in Staphylococcus aureus, which is more commonly known as MRSA. 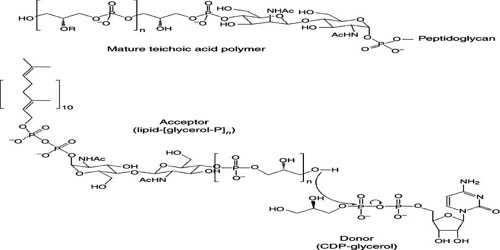 Teichoic acids that are anchored to the lipid membrane are referred to as lipoteichoic acids (LTAs), whereas teichoic acids that are covalently bound to peptidoglycan are referred to as wall teichoic acids (WTA). It is a structure found exclusively in gram-positive bacterial cell walls. This acid is formed through the joining of either glycerol phosphate or ribitol phosphate groups linked together with phosphodiester bonds. This structure is a polysaccharide with an overall negative charge. The most common structures are a ManNAc(β1→4)GlcNAc disaccharide with one to three glycerol phosphates attached to the C4 hydroxyl of the ManNAc residue followed by a long chain of glycerol- or ribitol phosphate repeats. Teichoic acid can bind to the bacterial cell wall in several ways. The polysaccaride can bind to the N-acetylmuramic acid linkages found in the thick peptidoglycan layer that is characteristic in gram-positive bacteria or to a lipid found in the deeper cytoplasmic layer. If bound to a lipid, the acid is called a lipoteichoic acid. Gram-positive bacteria that have been genetically modified to not have teichoic acid have been shown to have limited cell integrity and slower cell division rates, both of which reduce the overall fitness of the bacteria. Lipoteichoic acids may also act as receptor molecules for some Gram-positive bacteriophage; however, this has not yet been conclusively supported. It is an acidic polymer and contributes negative charge to the cell wall.